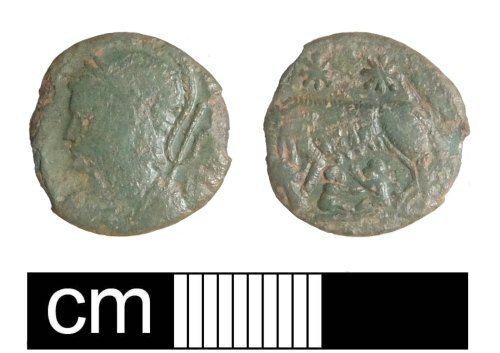 A very worn copper-alloy Roman nummus of the House of Constantine, probably a contemporary copy, dating to the period AD 330-340 (Reece period 17). VRBS ROMA reverse type depicting a She-wolf suckling twins, two stars above. Uncertain mint. The coin appears to have a CONSTANTINOPOLIS obverse combined with an VRBS ROMA reverse type. Diameter 14.3mm, thickness 1.4mm, weight 0.97g.